When I heard in January that Apple's soon-to-arrive iMovie 3 program offered a "Ken Burns" filter, my ears perked. I got really curious when I also heard that this third-generation iMovie could use still image catalogs created by iPhoto 2, Apple's updated photo-organizing program scheduled for release the same day. This meant that finally I could use iMovie to easily create "moving" digital movies using my thousands of scanned film and still digital images. My picture-based movies would no longer be just slideshows, my pictures could actually move across the screen just like all those old archival pictures that "pan and zoom" in Ken Burns' public television films on American history. Like many devoted Mac users the end of January, I luckily had a fast web connection to download both of these new programs. iMovie weighed in at 80 MB in size, and iPhoto arrived at 33 MB. Besides their hefty download size, what impresses most about these programs is their price. They are free. The revised iMovie presents a new face from earlier versions, but iPhoto's screen appearance looks much the same as the version it replaces. What makes iMovie 3's appearance distinctive is a new resizable editing window; no longer does it take over your whole Mac desktop. In addition, both programs take on a new brushed aluminum look with recessed red, yellow, and green buttons at top left, just like the appearance of the new Apple web browser, Safari. iMovie's Brushed Look: Apple's new and free iMovie 3 offers a beautiful face: A resizable editing window and a way for you to link to your existing iPhoto and iTunes libraries to use in your movies. The "images" window of pictures at right is an iPhoto 2 library that provided the content for this movie. If you use an older iBook or OS 9 you are out of luck with the new iMovie or iPhoto. These new versions require Mac OSX 10.1.5 as minimum and 256 MB installed RAM, and if you have an older "clamshell" iBook you're out of luck with iMovie 3 as it requires a screen with 1024x768 pixel resolution. Not only can iMovie 3 use your iPhoto picture libraries, it also lets you use your iTunes MP3 music files as movie soundtracks. With this new iMovie you can drag into the editing timeline still images from your iPhoto collections, and the same holds for music or sounds from your iTunes libraries. This integration between programs in Apple's "iLife" suite creates the potential for simple creation of digital movies in a way I have not seen before. Though I have not investigated the companion iDVD program designed to burn your movies to DVD disks, in theory this all sounds like a great one-stop set of programs for much of your music, pictures, and movie authoring needs. The key words here are "in theory." As I write, iPhoto 2 and iMovie 3.01 have been out now for about 10 days. First impressions are that iPhoto 2 is an improvement over the initial version. It seems to complete tasks faster, and I like the effects of the simple "retouch" and "enhance" tools that can make quick work of fixing color shifts and tonal ranges in pictures. For those of you with simple imaging demands, and your digital photo collections are not big, iPhoto 2 may be all you need for managing pictures. Yet, caveats apply. 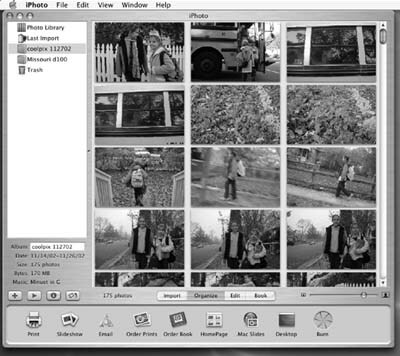 If you have a digital camera that shoots smaller digital files, say in the 3 megapixel range or less, iPhoto 2 seems to handle them reasonably quickly. I've imported multiple collections of 150-200 images produced by a 3.3 megapixel Nikon Coolpix 990, and iPhoto 2 handles them well with no great lag time. iPhotos Linked to Movies: Apple's new iPhoto 2 now can be a direct source of content for iMovie. All your iPhoto catalogs, like this one shown, are automatically available in a new "Images" window in iMovie 3. Yet, as picture collections grow in number and image size, program response slows. As a test I imported about 150 JPEG images from a Nikon D100, a recently introduced digital SLR that produces 17 MB files in Photoshop from JPEG image captures. These 6 megapixel files caused iPhoto 2 to slow to a crawl. Color correction actions that took a second or less in iPhoto 2 with my "Coolpix" files took three to five seconds when applied to these larger JPEG files from a Nikon D100. To keep these results in context we need to look at the speed of my computers. My Macs, though not the latest dual processor G4s, are not slow. Most of this anecdotal performance testing occurred on a pair of G4s: a G4/867 single processor with 1.5 GB RAM, and a dual processor G4/500 with 512 MB RAM. Both machines are running Mac OS X 10.2.3, and they run Adobe Photoshop 7 and Photoshop Elements 2.0 in a breeze. My main interest in these new Apple programs has been iMovie. Most changed from its predecessor, iMovie 3 shows the greatest potential for me as a useful media creation tool, as I've always taken many more still pictures than video with digital video (DV) cameras. Ever since Apple introduced its underlying QuickTime "movie-making" technology a decade ago, I've primarily used QuickTime and dependent movie-editing programs like Adobe Premiere to create "moving" digital movies from still pictures. Trying to get the still pictures in my movies to "pan and zoom" has been an ongoing challenge, and increasingly a frustrating quest. Older versions of Premiere let me achieve this easily, but for some reason versions beyond 5.1 eliminated the "Image Pan" filter in favor of more esoteric and complex ways to create the "pan and zoom" effect on still pictures. I still keep a Beige G3 Mac specifically to run Premiere 5.1 under OS 8.6, but as with all technology it would be easier to integrate newer tools into a more powerful Mac running the nearly crash-proof Mac OS X. 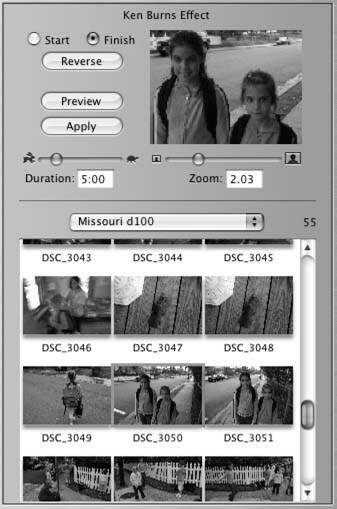 This is why I've been so interested in the new "Ken Burns" filter for creating motion across still pictures in iMovie 3. The "Ken Burns" filter does work. I have made several short movies in the past few days where the images pan and zoom, where images cross-dissolve from one to the other, where the audio has been music, voice, whatever I like. As a creative tool iMovie 3 shows lots of potential. Just Like PBS: The new iMovie offers a still picture "pan and zoom" effect named after Ken Burns, the public television producer who popularized the use of archival still images on his PBS programs about American history. But then there's iMovie's speed, or its lack of speed. Beyond any of its new features -- transitions, filters, titling tools, music integration, and ability to burn movies to DVD -- the most significant impression iMovie 3 leaves is its slowness to respond. To be fair, we need keep in mind that iMovie renders all transitions, titles, and effects on the fly as they are added to the movie timeline. These actions alone will cause an otherwise fast computer to be brought to a virtual standstill. Try it yourself: add five or six still images at once to the movie timeline. Depending on pixel dimensions of images, your Mac's CPU type and its speed, and your installed RAM, the duration of your wait will vary widely; this because iMovie by default applies the "Ken Burns" pan and zoom effect to still images as they are added to the editing timeline. This "on-the-fly" rendering is the way iMovie always has dealt with effects and the new version is no different. Other programs like Premiere work faster initially as you assemble projects because they do not render previews, transitions, and effects until you tell the program to begin this process. With iMovie you have no choice, effects all render as you assemble the project. My concerns about iMovie's speed are not about rendering of effects. Simple actions like selecting still images from iPhoto libraries, linking to existing iTunes libraries, and moving clips and images in the iMovie timeline all feel slow and pondersome, regardless of what Mac I use. I have tried to optimize my Mac according to recommendations lately on the various Mac-oriented websites: use disk utility to fix Mac OS X permissions on the boot disk; resize the iMovie window to its smallest size; keep movies short; and the like. As a comparison, in the past few days I visited a local Apple company store to see how iMovie 3 fared on one of their new display-model G4 800mhz flat-screen iMacs. My test was brief, all I did was try to play the iMovie timeline. Sound dropped out, frames were jerky on screen. This was not a smooth performance. Clearly to me, Apple has work to do on iMovie 3. When I heard that iMovie 3 with its "Ken Burns" filter was soon arriving, I was ready to tell all my Mac friends that iMovie 3 is a must upgrade. Several of my office friends recently bought 700mhz iBooks (at my advice.) When Apple has released some cool new program such their web browser, Safari, I've made sure they know. I've must admit I haven't said a word to them about iMovie 3. I love the concept, design, and features of iMovie 3, and hope that Apple can figure out soon how to make it feel more responsive, more spritely. It's way too slothful for me now, and I don't think a person should have to buy some 1.42 Ghz dual-processor G4 tower just to successfully run this new iMovie. If Apple positions iMovie as its consumer-level movie editing program, then Apple should make sure iMovie 3 works well on its consumer-level Macs. Right now it does not. At the moment I would tell my office friends to stick with iMovie 2. iMovie 3 in its present form would be quite a slowdown for them, despite its potential, Ken Burns notwithstanding. Docking iLife: Here's how the Mac OS X desktop Dock looks if you install all the new "iLife" programs just released from Apple. They include from left, iPhoto 2, iMovie 3.01, iTunes 3.01 and iDVD 3. Pi member Dennis Dimick has been covering the Apple QuickTime and digital movie-making scene for the Journal since 1992. He can be reached via email: ddimick@aol.com.